Old Divers never die . 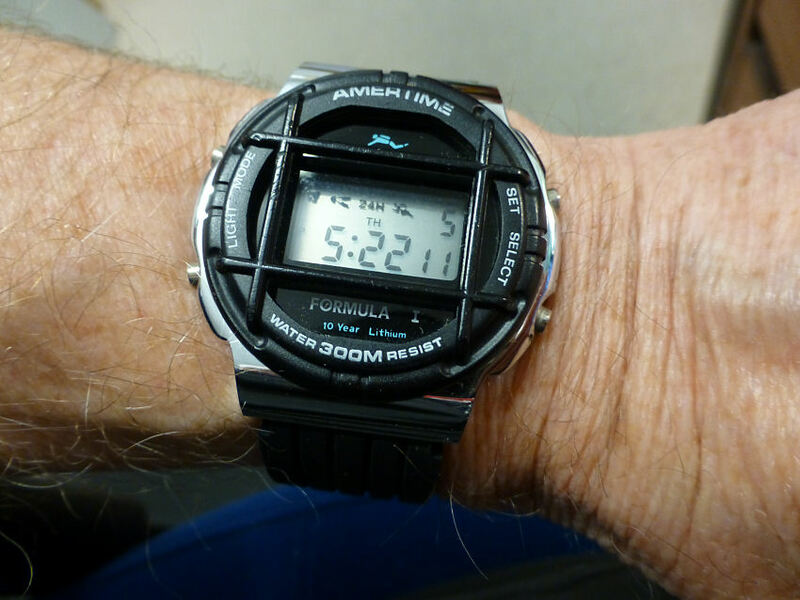 . .
There’s something about old digital watches I just love. Part of it is the fact that so many of these models were in that transitional phase, where manufacturers were experimenting with what was really fast moving new technology. Digital modules that seemed and promised to do almost anything often produced sometimes great and sometimes odd looking models as a result. The major Brands, Casio, Seiko and Citizen invested heavily in this new technology and of course led the way, but there were those guys on their coat-tails, using those same modules, but with their own ideas of how to utilize them. And so it was an amazing time, a free-for-all and resulting in some almost one off models that retro nuts treasure today. Take this well used 300m Diver, Alarm and Chronograph model with the old style dial guard. 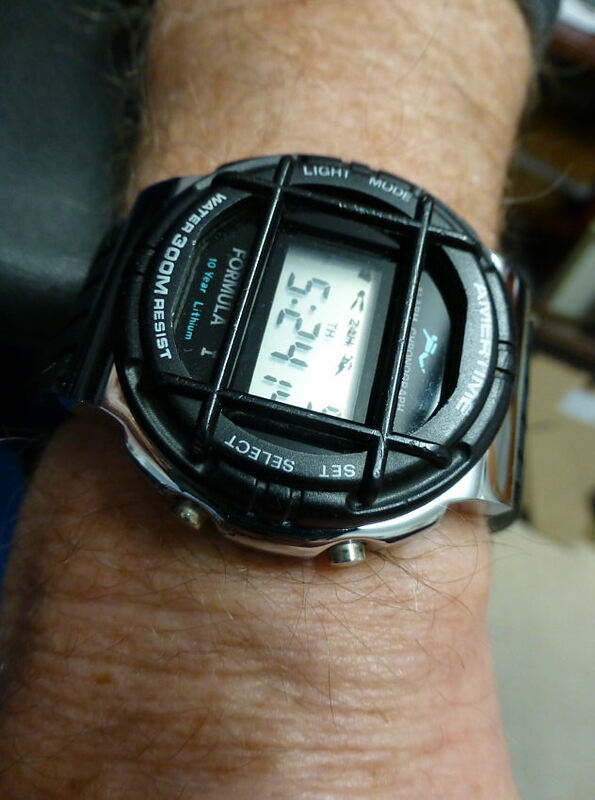 It has features and functions similar to both Casio and Seiko modules at the time, but clothed in different garb and sporting a 10 year Lithium battery no less and we’re talking here of perhaps the mid 1980’s? Obviously targeted at Snorkeling enthusiasts and/or divers according to the symbol above the display, this particular non-mainstream model looks such a one off today. It’s a bit like the very old days when pocket watches transitioned to wrist and civilian models aspired to military (with dial guards too). This model had an odd rubber strap which didn’t fit too well, being too small at the lug ends, soI swapped it out for a deployment silicon one after a bit of cutting. And it looks OK. I have to be impressed with the 300 meter claim and if correct, is a testament to the case and back construction, though once I get the back off, I should know considerably more. But I’ll delay doing that as sometimes with these old digitals, start meddling and sometimes trouble comes along, so perhaps I’ll wait until the battery needs replacing. The display however is remarkably bright and with good contrast, so it might be a while before the battery does give up the ghost. Incidentally the case screw back is in Stainless Steel, marked 300 Metre and has a snorkeling man symbol, plus the Brand name Amertime. 300 meter Diver, well used and still good to go. I love the look of this one, as the steel case to dial ratio is well balanced and proportioned and that in your face guard doesn’t obstruct the view of the dial as it’s center window is actually framing the digital display perfectly. Part of the fun with these obscure models is the investigation of their origins. This module for example is has an odd display set with three levels of data. First a data line the top level, a Date & Day line next, then the main Time line below. However the Day text is small but unusually it’s also positional. In other words as the Days of the week progress, the Day changes and basically moves along the display, the Days obviously hidden on that text line and highlighted as required. I have to confess I’ve not seen this before. More commonly in Week progression the Days are permanently marked on the case or glass and a short digital dash marker would highlight under the appropriate Day. Functions and display appear in some ways similar to the Seiko 4 button A914-5010 Module, which was around in the mid 1980’s, which would fit with the date estimate for this model. I wouldn’t be surprised if it was a Seiko module derivative, as more often than not it’s Seiko modules that seem to survive, as opposed to other brands. However I’m unable to find out much about Amertime. The name suggests Amertime (watches and jewelery) which seems to be a resurrected Company name (2000), though as it was reborn perhaps 15 to 20 years after this model appeared, probably of little relevance. Anyone who has any information regarding the Brand is welcome to drop me an email or comment, should you wish to share. I’d appreciate it . . . . This entry was posted in Spotlight and tagged 300m Diver, Amertime. Bookmark the permalink.